There’s never a wrong time to upgrade the old garage. Whether you’re just moving in to a new place and looking to modernize it or just giving your old garage a face lift, actually finishing it can be a daunting task. Thankfully we’re here to help you find the top garage floor options. 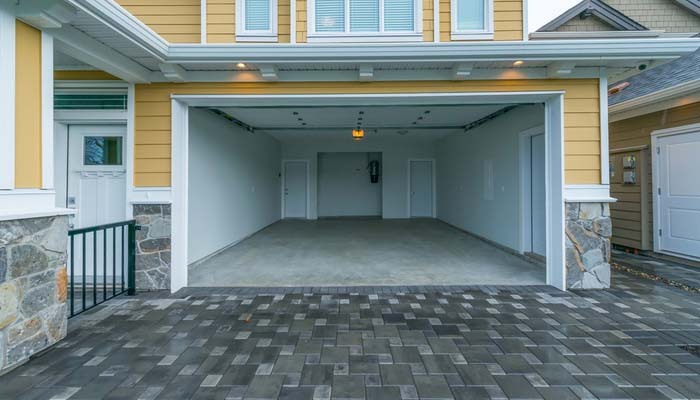 There are a ton of options available when it comes to finishing a garage floor. While plain concrete works, it’s not flashy and it’s pretty bland. If you’re looking to spice up your garage space and make it much more impressive, try some of these options. One of the more straightforward ways to address finishing your garage floor would be to use a covering. Coverings come in a variety of styles, so we’re going to go over some of the more common types. It’s worth noting that while you can put any old rug down in the garage, it might not survive repeatedly being run over by a car. Tiles are a very common style of covering. Varieties of tiles used in garage coverings include wood composite, flexible rubber and rigid plastic. Which kind you prefer depends on what material and appearance you like. Rubber tiles have a lot of give and can look very slick, for instance. Wood composites have a more natural look but are a bit more rigid. Rigid plastic is popular among people who have a smaller amount of garage traffic and want to spend a bit less. Typically rigid plastic costs less than rubber or wooden tiles. Another type of covering is a garage mat. Garage mats come in a variety of durable, tear-resistant materials and many sport cool designs. Coverings are ideal for people who want a bit of style without changing their garage floor. Coatings are another popular garage floor finishing. They’re a bit more intensive than simple coverings, as they literally coat your garage’s floor. That said, there are a few different coatings you can apply and they’re markedly different. The two coating types commonly seen are paint and epoxy. 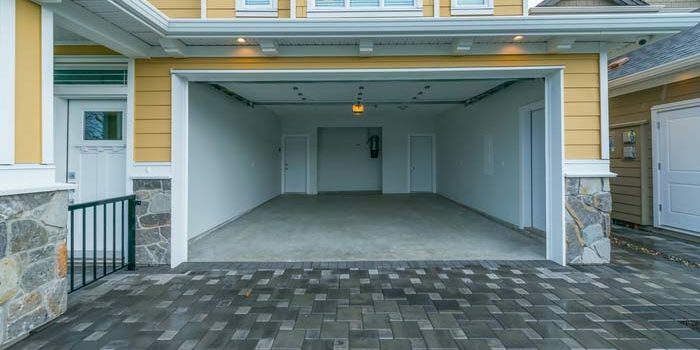 Paint is a straightforward way to make your garage floor look way better. If it’s badly stained and looking like it’s seen better days, a quick layer of paint can bring it way up. Namely, garage floors are best served by latex paints. They’re generally inexpensive and not difficult to apply. All you need is to clear the floor space and get a roller brush! Another example of coatings is epoxy. Epoxy is a bit different from paint, with a decidedly more complex process to apply. The main difference between epoxy and paint is mainly that epoxy can treat your floor and make it more durable and long-lasting. However, the trade-off for this is that epoxy coatings are more expensive and more complex to apply. Consider epoxy if you have a very busy and highly trafficked garage. If you’re thinking of converting your garage into a livable space you’ll need to insulate the concrete slab. As you’re certainly noticed, the slab gets downright cold in the winter months. That’s not a problem if it’s insulated, though! Many people will even insulate their concrete slab just to make their garage more comfortable. Insulating a slab is a bit more complex than other floor finishing methods. It will likely require a contractor to help with the work, unless you’re particularly handy. As always, we caution you to exercise discretion when working with heavy, dangerous equipment. Another option, besides just installation, would be installing a radiant floor heating system. These are typically not difficult to install in existing concrete slabs. These will make your often-cold concrete slab significantly warmer and much nicer in the winter. Consider a radiant heater if you do a lot of work in the garage and want the floor a little warmer. Remember, if your floor is badly damaged by grease and oil, coatings and coverings alone aren’t enough. Just covering the cracks up with a mat or a coat of paint doesn’t make the problem go away. Often, such damage will require the floor be refinished. While this is a significant expense, it greatly increases the value of a given home. Additionally, remember that if you’re going to paint or epoxy your garage floor that it needs to stay dry. That means you’ll need to be careful about spilling oil or grease onto the floor and be diligent about cleaning it. If your garage is a very moist area and condensation develops on the concrete, consider getting a dehumidifier to let your coatings last longer. This will increase the value of your house and help your hard work endure. No matter what garage floor options you go with, take care of them.